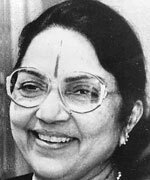 Dr. Paluvayi Bhanumathi Ramakrishna Telugu: (born on 4 October 1925 - 24 December 2005) was a noted Indian film actress, director, music director, singer, producer, book writer and songs writer. Most of her works are in Telugu and Tamil languages.She was born as third child to Saraswatamma and Bommaraju Venkata Subbaiah, in Doddavaram village of Prakasam district, Andhra Pradesh. She grew up watching her father performing stage shows. Her father, Venkatasubbiah, was a staunch lover of classical music and gave her early training in music. She made her debut in Telugu cinema in 1939 in Varavikrayam (Telugu), directed by P. Pullaiah. She had acted in Malathi Madhavam, Dharma Patni and Bhaktimala. Her first popular film was Krishna Prema. Her next popular film was Swargaseema, a milestone film in her career. She later acted in many memorable movies like Chakrapani, Laila Majnu, Vipranarayana, Malleswari, Batasari and Anthastulu. In 1953, she made her directorial debut with 'Chandi Rani' (made simultaneously in Tamil, Telugu and Hindi). Her last film was made in 1998, entitled Pelli Kanuka. Annadurai gave her a title "Nadippukku Ilakkanam" (means Grammar for acting) that suits her aptly. Apart from being an exceptional actress, she was also a very talented musician. She is one of the fine actress of telugu film industry. She was adept in both Carnatic and Hindustani music. She gave voice to her songs even after it became the norm to use playback singers for actors. Some of her songs are still popular like Pilichina biguvatara, Kila Kila Navvul, Oh Pavurama, Preme Nerama. She also provided music to a lot of her films. Bhanumati was awarded the Padma Bhushan, the third highest civilian recognition by the Government of India. She won the best actress awards multiple times. She also won the Best Director award at the state level.